Sweetwater Sound is a musician&apos;s dream come true. 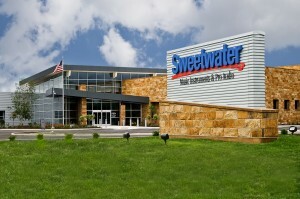 According to its website, "Sweetwater began business 33 years ago in Fort Wayne, and is the country&apos;s most respected dealer in high-technology equipment for musicians, recording studios, and broadcasters - from microphones and digital recording systems to electric guitars to electronic keyboards and electronic drums. Sweetwater customers range from beginners to rock stars. The company&apos;s equipment can be found in Los Angeles, New York, and Nashville recording studios, TV and radio stations all across the country, as well as in tens of thousands of home recording studios nationwide. Sweetwater is built on a commitment to the highest level of customer service in the music technology industry." So, where to begin? The Sweetwater experience starts the moment the visitor arrives in the lobby. The Sweetwater Mall is open to the public and houses an incredible array of customer and employee amenities, including a diner, a game area, an employee health club, concierge service, and more! Insider&apos; Tip: Be sure to eat at their cafeteria, which serves up delicious food. 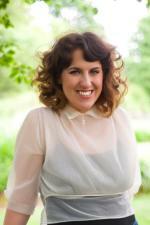 Interested in the recording side of the business? The campus&apos; world-class studios were designed by acoustics wizard Russ Berger and feature state-of-the-art Digidesign ICON consoles, and a wide selection of microphones and outboard gear. Be sure to check out the theatre, which hosts regular performances. 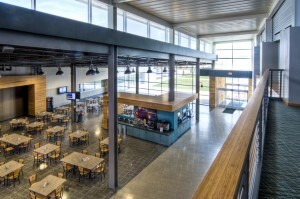 The theatre features four different sound systems and acoustic design by Russ Berger. Sweetwater isn&apos;t just for current musicians, however. They cater to aspiring ones, as well. The Sweetwater Academy of Music offers professional, personal guidance in one of our custom-built studios, and perform recitals in a world-class music venue. Environmentally conscious types will appreciate the fact that the LEED-certified building conserves water, energy, and resources. Be sure to check out their events page to stay tuned for information on clinics and workshops.